Background: Work hazards have been a major cause of concern in driving industry especially in taxi drivers. This study integrates the various factors that influence physical and emotional well-being of taxi drivers into the theoretical model that shows that the work environment, stress and personality characteristics directly influence taxi drivers' health. Objective: The aim of the following study is to study the relative and combined influence of work environment, personality characteristics and stress on the health of taxi drivers. Meterials and Methods: The present study is cross-sectional (descriptive) study taxi drivers in Mumbai. They are selected using multistage random sampling method. Calculated sample size is 508. 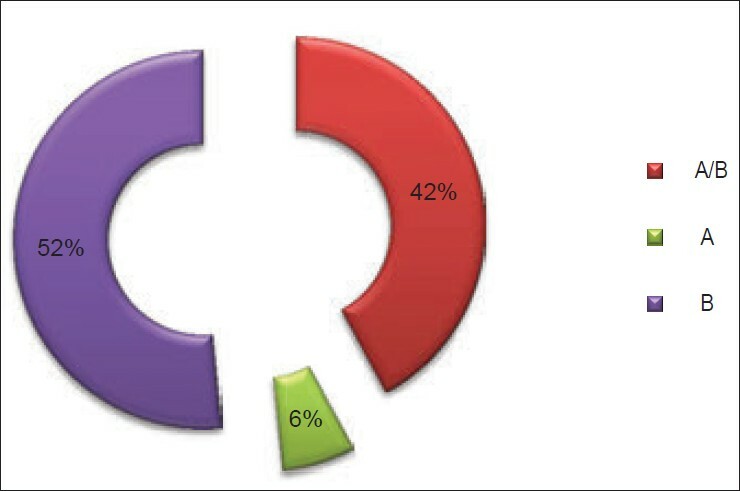 Data produced after the survey is analyzed using IBM SPSS 16.0 software. Results: Nearly 65% of taxi drivers belonged to middle-age group of 21-40 years of age. Majority (59%) of taxi drivers belonged to the lower upper socio-economic class. 70% of taxi drivers worked for more than 8 h daily. 63% gave the history of one or more addictions. 52% taxi drivers had type B1 personality, only 6% had stress prone and aggressive type A1 personality. Traffic congestion (67.1%) was reported as the leading stressor followed by narrow bottle neck roads (43%), too many speed breakers (41%), rude gestures and behavior by other drivers (42%) and bad weather (36%). Nearly 86% taxi drivers had one or more symptoms of morbidities. Gastrointestinal symptoms predominated followed by musculoskeletal symptoms and depression. Conclusion: Socio-demographic attributes, work environment, stress and personality significantly influence physical and psychological morbidities in taxi drivers. Taxi industry is quite different from conventional occupations; the employee has ambiguous work hours and the income fluctuates on a daily basis. , In recent times, researchers have begun to take an integrative approach to improve workplace health and safety  thus the importance of researching workplace health and safety in unconventional industry such taxi driving may be pivotal in promoting health and safety behavior. present study was a cross-sectional community-based study, it included a single questionnaire based oral interview of the taxi driver and the questionnaire was administered by the principal investigator at taxi stands (while taxi drivers were waiting for customers) after explaining about the study and taking their informed consent. The personality assessment was done with standard the tool; the results of such assessment were evaluated with the help of Psychiatry resident. The study was carried out over a period of 1 year from August 2010 to July 2011. The calculated sample size (n ) =483. So the calculated sample size for the study was 483, considering the probability of incomplete case study form as 5%, we took extra 25 interviews the final sample size was 508. They should be willing to participate in the study. Taxi drivers not willing to participate in the study. If the taxi driver did not satisfied the selection criteria or refused to give consent for the interview, the next consecutive taxi driver in the list selected and interviewed. Part 4 consist of questions related to physical and mental ill health and general and systemic examination of the study subject. The final data collection instrument included a semi-structured questionnaire. The questions were framed in such a way that the study subject would be able to understand and answer them properly. Permission to conduct the study and ethical clearance was obtained from the institutional ethics committee. Descriptive analysis for the data was done for socio-demographic variable, family history, occupational history, personal history, personality type, occupation related or unrelated stressors, symptoms of physical morbidities and depression and for blood pressure (BP). Binomial logistic regression analysis was used for determination of association between the taxi drivers' socio-demographic variables, personality type, stressors and morbidities symptoms and hypertension. Out of the sample of 508 taxi drivers interviewed, 65% of belonged to middle age group of 21-40 years of age. The mean age of the taxi drivers in given study was 36 with a standard deviation of 11 years. All interviewed taxi drivers were male. Majority of taxi drivers (91.5%) were married. 66% of married individuals have stayed with their families. 37% taxi drivers had education up to the matriculation (10 th class) level, 26% up to primary school, 17.5% were illiterate. Most of the taxi drivers were of Hindu religion (78%), followed by 23% who belonged to the Muslim religion. More than ½ (60%) taxi drivers were originally from outside Maharashtra, 40% taxi drivers were local. Out of those taxi drivers from other states, 48% were originally from Uttar Pradesh [Table 1]. 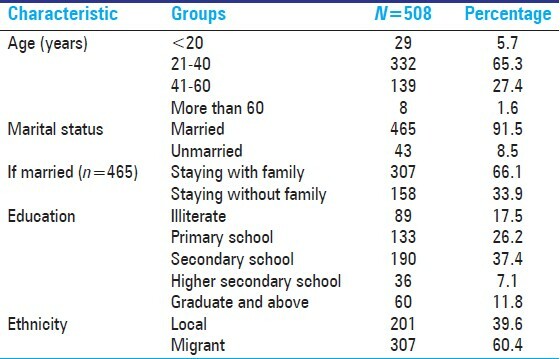 Majority (59%) of taxi drivers belonged to the lower upper class (IV) of Modified Kuppuswamy classification, 36% were in lower middle class (III) [Figure 1]. Maximum (54%) number of taxi drivers choose taxi driving because of unemployment, 21% because of lack of education and 10% by interest. 52% taxi drivers were working in the occupation since 6-15 years, while mean years of service were 13 years with 8 years of standard deviation. 40% of taxi drivers worked for more than 10 h daily, while 35% taxi drivers worked 8-10 h/day. Mean working hours per day were 10.2 h/day with a standard deviation of 1.6 h. 41% of taxi drivers worked in a shift mode. Out of those 207 taxi drivers working in a shift mode, the majority (68%) worked in night shift. The most common reason for this was insistence by the taxi owner (66%) [Table 2]. 54% of 508 taxi drivers drove the taxi on monthly rent, while 46% had their own taxi. Out of 274 taxi drivers, who had a taxi on rent, maximum number of taxi drivers (43%) got a 30-40% of monthly income share, and 33.5% got 40-50% of monthly income share. The means of reaching towards taxies on rent for most of the taxi drivers was walking (61%), followed by bus (35%) and local train (4.3%). 37% of taxies were 5-10 years old, while 32% were less than 5 years old. Taxies older than 10 years were 156 (31%). 46% taxi drivers were involved in traffic offenses in last 1 year. The most common traffic offense was parking taxi in no parking zone (57%), followed by breaking signal (42%). Maximum number of traffic offenses was personalized by giving bribe (58.5%), only 41% were penalized as per law. Traffic congestion was the major constraint (67%) in day to day working for most of the taxi drivers. Other constraints were bad behavior by traffic constables and other drivers and road conditions. The personal history of taxi drivers revealed that, out of 508 taxi drivers, majority (67%) had mixed diet, 29% were vegetarian. 42% taxi drivers were frequently taking food on time, 38% occasionally had food on time. 51.6% slept for 7-8 h a day, 48% slept for less than a 6 h/day. In 42.5% bowel habits were irregular. 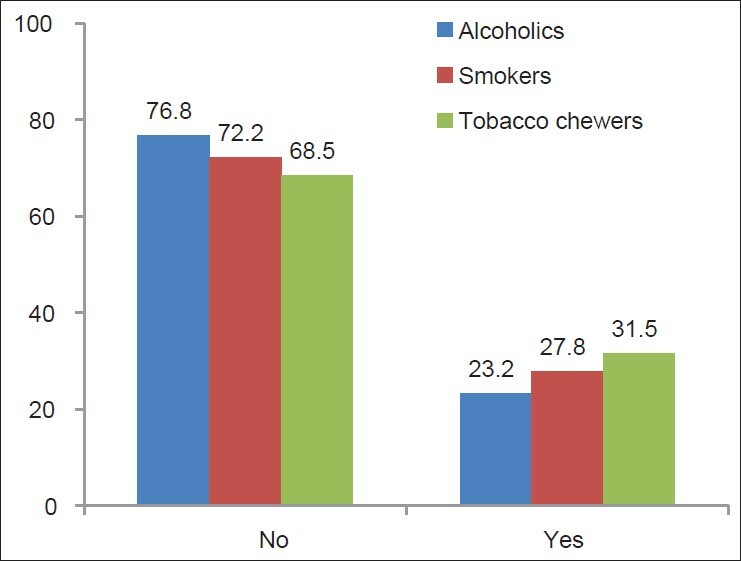 32% were addicted to tobacco or ghutka chewing, 28% were smokers and 23% were alcoholics [Figure 2]. Weekly offs and activities at leisure are required to give rest to the body and mind. Though majority of taxi drivers (60%) had weekly offs, only 15% indulged in activities at leisure. Out of these 60% taxi drivers, 43% did house hold work, 31% went for entertainment activities such as television, cinema, radio, only 12% taxi drivers were involved in reading or writing. Still, maximum number of taxi drivers felt relaxed in leisure time (91%). Assessment of personality especially in relation to stress proneness was done. 52% had type B1 personality, while 42% had A/B type personality, and only 6% had stress prone and aggressive type A1 personality [Figure 3]. Assessment of occupational and non-occupational stressors among taxi drivers showed that, out of 508 taxi drivers, maximum felt always stressful during traffic congestion (67.1%), while 42.5% and 41% taxi drivers always felt stressful due to narrow bottle neck roads and too many speed breakers respectively. The other important stressors were rude gestures and behavior by other drivers (41.5%) and bad weather (36.4%). Assessment of morbidities in taxi drivers showed that, out of the 508 taxi drivers, maximum had symptoms suggestive of any morbidity (86%), only 14% taxi drivers were free from any symptoms. 37.6% taxi drivers had a history of hospitalization in the past 1 year. 25% were diagnosed as having some chronic disease in last 1 year, hypertension (63%) being the most common, while 9% taxi drivers had asthma. Assessment of physical symptoms of taxi drivers showed that gastrointestinal system (62%) was the most common system involved. Second common system involved was musculoskeletal system. 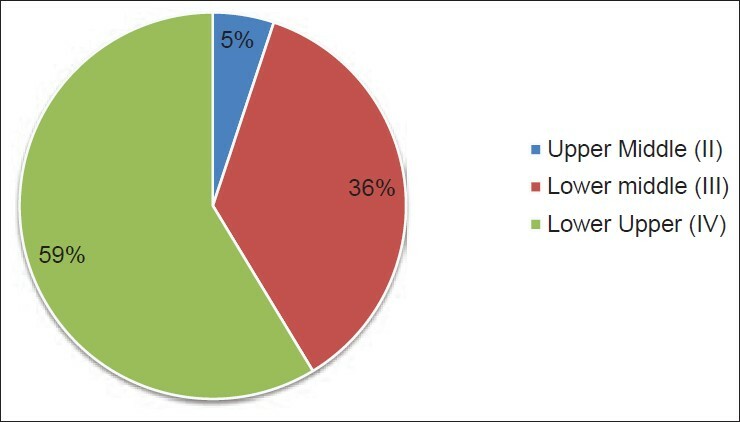 Cardiovascular complaints were given by only 11% out of 508 taxi drivers. Apart from these complaints 32% taxi drivers had headache as non-specific complaint. 33% taxi drivers had symptoms suggestive episodes of depression. 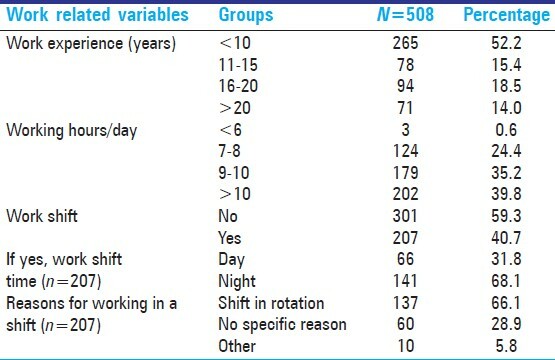 On BP examination of taxi drivers, 17% had hypertension and 12% were detected to have isolated systolic hypertension [Table 3]. Logistic regression analysis was used to find out the contribution by the study factors to the occurrence of morbidity symptoms in taxi drivers and to develop regression model to predict the occurrence of that specific set of symptoms. For isolated systolic hypertension, overall contribution by the factors under consideration was 39%. Personality A/B was the most significant predictor of isolated systolic hypertension followed by personality type A1, smoking and stressors like rude gesture and behavior by other drivers. The logistic regression model of all of these factors predicted a 20% occurrence in isolated hypertension in taxi drivers. The aim of the study was to integrate the various factors that influence physical and emotional wellbeing of taxi drivers into theoretical model that shows work environment, stress and personality characteristics directly influence taxi drivers' health. Socio-economically 298 (59%) taxi drivers belonged to upper lower class by Modified Kuppuswamy classification. Only 26 (5%) belonged to upper middle class. This finding reflects the low level of income from the occupation or it may be due to the fact that the population joining the occupation is mostly from low socio-economic class. This finding was similar to the study by Facey  in Canada. In this study, researchers found low socio-economic status in taxi drivers. The reasons given were economic exploitation by leasers of taxi permits and economic uncertainty of the occupation. The findings of work experience and working hours of taxi drivers in present study were similar to the study of Anthony and Jillian. with respect to work experience and work hours. This similarity gives perception that working hours of taxi driving are similar across countries like India and Australia. The other studies which have similar findings are by Miyamoto et al. and Chen et al. In present study, 274 (54%) of taxi drivers drove rented taxies and 234 (46%) were involved into one or more traffic offence. The practice of renting taxies to license drivers may lead to economic exploitation of taxi driver. The income share is decided by the taxi owner and the taxi driver has to reach to the parked taxi by his own cost. This adds to economic misery of taxi drivers and ultimately the ill health as they work for long hours, skip meals or have unhealthy fast food and do not take time off to earn more. The economic uncertainty may influence risk taking behavior in the form of traffic offences like parking in no parking and breaking signals to get customers. The circle of economic exploitation completed when taxi driver was penalized or bribes for traffic offence. Most of the drivers in our study had irregular timing of diet, slept less than 6 h, had irregular bowel habits and addicted to one or more substance. The irregularity of bowel habits may be caused by irregular timing of food intake, sleeping for less than 6 h and addiction like alcohol, smoking and tobacco chewing. The report on health of professional drivers by Whitelegg. confirms this relation. Weekly offs and leisure time activities can act as stress buster. In the study though 60% taxi drivers had weekly offs but in this leisure time they are busy with other house hold work, so these work off days are not providing needed rest and relaxation to the taxi drivers' body and mind. The taxi drivers in present study always felt stressful towards traffic congestion, narrow bottle neck roads, too many speed breakers, rude gesture and behavior by other drivers. The studies conducted by Duffy and McGoldrick,  Hennessy  and Whitelegg  confirmed, traffic congestion as a significant stressor in professional drivers. The other important stressors were related to road conditions and rude gesture and behavior by other drivers. 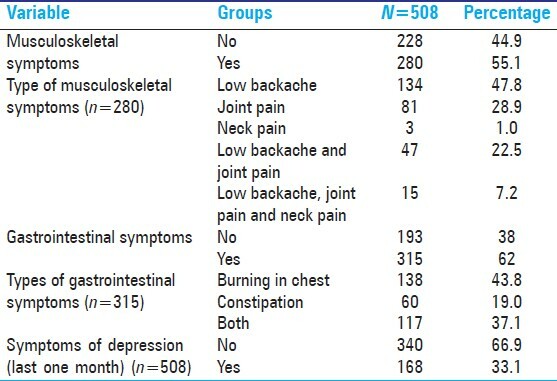 Gastrointestinal and musculoskeletal symptoms are common in studied taxi drivers. This finding was confirmed by Ueda et al.,  Whitelegg  and various researchers. The cardiovascular complaints can be a symptom of coronary heart disease. The study by Kurosaka et al. confirms high prevalence of coronary heart disease in taxi drivers as compare to non-drivers. It can be explained by higher presence of coronary risk factors like hypertension, smoking and job stress in taxi driver. The other common symptom found was headache; it may be caused by stress, lack of sleep or may be the symptom of hypertension. 168 (33%) of taxi drivers had at least five or more symptoms of depression in last 2 weeks. Xiong et al. found that the level of drivers' mental health is much lower than that of common people. Researchers like Anthony and Jillian  hold the factors like hazards in the work environment, individual factors, and the organizational factor together responsible for lower levels of emotional well-being in taxi drivers. The study concluded that the physical and emotional morbidities in the studied taxi drivers were determined by demographic factors, personal habits, addictions, personality traits of taxi drivers like type A1 and A/B behavior pattern and occupational stressors. 1. Whitelegg J. Health of professional drivers, a report for transport and general union. Ecologica Limited; 1995. 2. Dalziel JR, Job RF. Taxi Drivers and Road Safety: A Report to the Federal Office of Road Safety, Department of Transport and Regional Development, Canberra; 1997. 3. Haines F. Taxi drivers survey-Victoria. Understanding Victorian taxi drivers experiences of victimization and their preferred preventive measures-A report for Victorian Taxi Driver Safety Committee. [Last accessed on 2002 Aug 23]. 4. Chu C, Dwyer S. Employer role in integrative workplace health management: A new model in progress. Dis Manage Health Outcomes 2002;10:175-86. 5. Facey ME. The health effects of taxi driving: The case of visible minority drivers in Toronto. Can J Public Health 2003;94:254-7. 6. Anthony M, Jillian MD. Predicting Health Outcomes and Safety Behaviour Paper Presented in the 5 th Australian Industrial and Organisational Psychology Conference. Melbourne, 26-29 June, 2003, Australia. 7. Miyamoto M, Konno S, Gembun Y, Liu X, Minami K, Ito H. Epidemiological study of low back pain and occupational risk factors among taxi drivers. Ind Health 2008;46:112-7. 8. Chen JC, Chang WR, Chang W, Christiani D. Occupational factors associated with low back pain in urban taxi drivers. Occup Med (Lond) 2005;55:535-40. 9. Chen JC, Dennerlein JT, Shih TS, Chen CJ, Cheng Y, Chang WP, et al. Knee pain and driving duration: A secondary analysis of the taxi drivers' health study. Am J Public Health 2004;94:575-81. 10. Hennessy A. Influence of traffic congestion, daily hassels and traits stress susceptibility on driver's stress. J Appl Biobehav Res 2000;5:162-79. 11. Duffy CA, McGoldrick AE. Stress and bus drivers in UK transport industry. Int J Occup Hyg 1990;4:17-27. 12. Ueda T, Hashimoto M, Kosaka M, Higashida T, Hara I, Kurimoto T. A study on work and daily life factors affecting the health of taxi drivers. Nihon Koshu Eisei Zasshi 1992;39:11-21. 13. Kurosaka K, Daida H, Muto T, Watanabe Y, Kawai S, Yamaguchi H. Characteristics of coronary heart disease in Japanese taxi drivers as determined by coronary angiographic analyses. Ind Health 2000;38:15-23. 14. Bigert C, Gustavsson P, Hallqvist J, Hogstedt C, Lewné M, Plato N, et al. Myocardial infarction among professional drivers. Epidemiology 2003;14:333-9. 15. Xiong W, Xiong G, Yu W. Influence of sports prescription on taxi drivers mental health in China. J Beijing Sport Univ 2009-10;10:2009. CNKI: SUN: BJTD.0.2009-10-02. 16. Soodabeh N, Mansoor M, Ali M. Driving environment in Iran increases blood pressure even in healthy taxi drivers in Iran. J Res Med Sci 2008;13:287-93. 17. Nasri H, Moazenzadeh M. Coronary artery disease risk factors in drivers verses people in other occupation. ARYA J 2006;2:75-8.